I wanted to try arachuvitta sambar without dal for long time. My friend told it tastes great for both rice and idli. So I wanted to give a shot and I had bookmarked some YouTube videos too. Finally I tried it last week for my lunch as I was in short of toor dal in my kitchen. This is more like Tamil brahmin’s style varuthu aracha kuzhambu / arachuvitta kulambu for rice but without using dal. You don’t need to use toor dal or moong dal in this recipe. The aroma of freshly roasted and ground spices is the highlight for this sambar recipe. It helps to give great flavor and thickness to this sambar. Not only dal, less tamarind and coconut is used in this recipe. When you feel bored of the regular paruppu sambar for rice, you can try this. 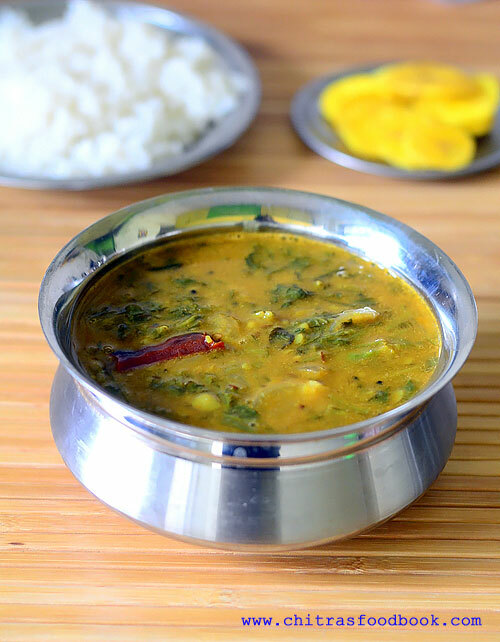 If you want to avoid dal in your diet for health reasons, you can make this kuzhambu. As I prepared this with mixed vegetables like carrot, beans, potato, chayote, brinjal it came out very flavorful, tasty and healthy. You can also add drumstick, lady’s finger, pumpkin, turnip if you like. You can also prepare this masala powder in advance and make this sambar instantly. 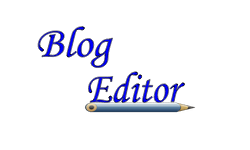 Bachelors and working women would find it helpful. 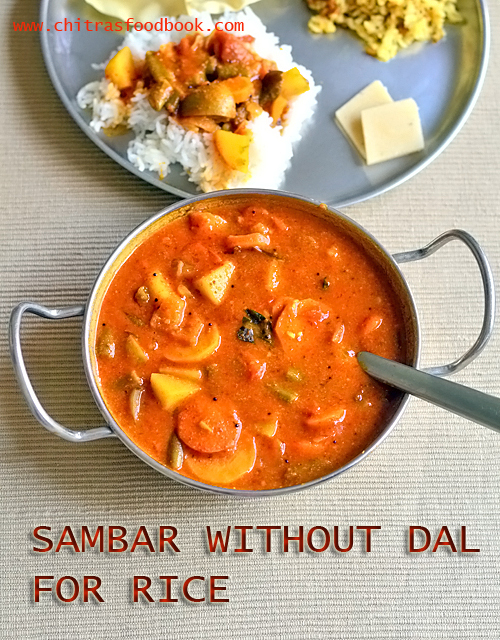 Friends , do try this sambar recipe without dal and enjoy with rice. 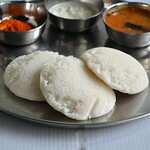 I personally liked it with idli, dosa too ! Arachuvitta sambar without dal for rice adding mixed vegetables. Wash and chop all the vegetables into cubes. Set aside. Heat oil in a kadai and roast all the ingredients given under ‘To roast’. Lastly add coconut, roast for a minute. Grind to a powder. Set aside. Heat oil in a pressure cooker base. Saute onion,curry leaves and mixed vegetables. Add tomato and saute till mushy. Add turmeric powder, sambar powder, salt and tamarind extract. Lastly add the ground powder, mix well. Add some water if needed. Pressure cook for one whistle in low flame. Temper mustard seeds in ghee and add to sambar. Garnish with coriander leaves. 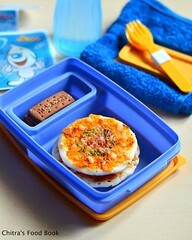 Enjoy with plain rice ! Wash and chop vegetables, onion, tomato and set aside. Soak tamarind in 1 cup of water. Heat oil in a kadai. Roast chana dal, coriander seeds, red chilli, methi seeds, cumin seeds, raw rice in low flame till nice aroma arises. Lastly add curry leaves , grated coconut. Saute for a minute. Switch off the flame. Grind to a powder. Set aside. Heat oil in a pressure cooker base. Saute onion few curry leaves, mixed vegetables. Then add tomato and saute till mushy. Add salt, turmeric powder, sambar powder. Saute well. Add 1 cup of tamarind extract. Add the freshly ground masala powder too. Mix well. If the kuzhambu is too thick, add 1/2 cup more water. Pressure cook everything in very low flame for one whistle. For this, keep the flame high till steam comes out. As soon as steam starts to come off, reduce the flame to completely low. Pressure cook in low flame for one whistle. Switch off the flame. Remove the lid after steam is released. Mix well and see the consistency of kuzhambu. If thick, add some water, check for salt and boil for a minute. If fine, you can do the tempering part. For tempering , heat ghee in a small kadai. Splutter mustard seeds, curry leaves and cumin seeds. Add to the sambar and mix well. Garnish with coriander leaves. Close the bowl with a lid. Give a standing time of 30 minutes to 1 hour for best taste. Tastes great the next day. So you can refrigerate and use this kuzhambu for 2 to 3 days. Adjust the quantity of red chillies as per your taste. I used byadgi chillies which gives bright color but tastes less spicy. Flavor of this sambar varies based on the red chilli. 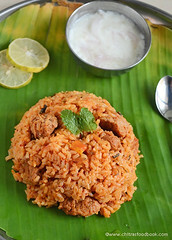 Addition of rice in the masala helps to give thickness to the kuzhambu. You can skip it too. 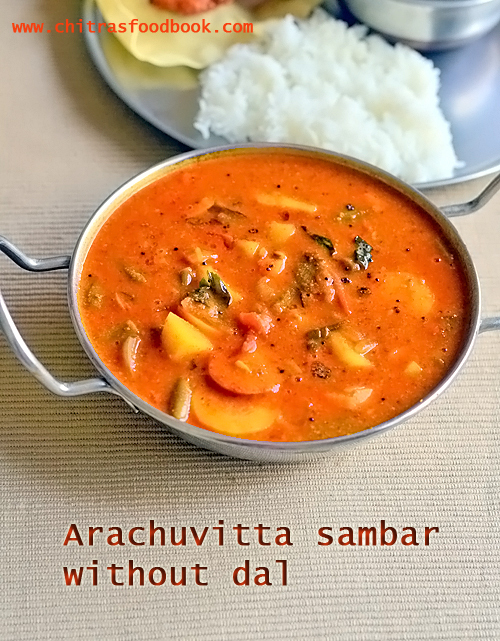 Try this yummy arachuvitta sambar without dal. Enjoy with plain rice adding a tsp of ghee ! 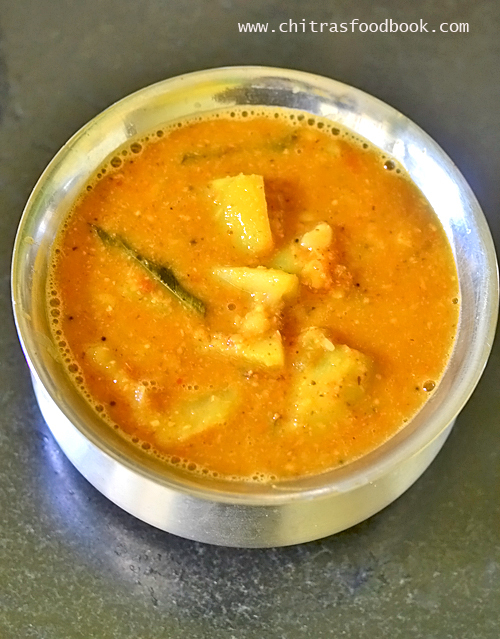 Sorakkai sambar / Bottle gourd sambar with freshly ground spices (Arachuvitta sorakkai sambar in Tamil) is an yummy, flavorful sambar recipe for rice. I have never tried varieties of sorakkai recipes for rice apart from paal kootu , Poricha kuzhambu, sorakkai dosai and poriyal. When I heard about this sorakka sambar from my neighbor, I was tempted to give a try. Basically bottle gourd is a bland vegetable. It doesn’t have any appealing flavor or taste. But its a healthy vegetable with lots of benefits. It has more water content which helps for weight loss, provides cooling effect to body, reduces liver inflammation, treats constipation etc. So I try to include this veggie atleast once in a week in my diet. For this sambar instead of following my usual sambar recipe, I added Tamil brahmin style arachuvitta sambar masala by roasting and grinding the spices, chilli and coconut. It came out very well with an awesome aroma. We loved this sambar very much. In Karnataka, my friends make Sorakkai sambar in a different way by adding a different masala. Soon I will try to learn from them and make a post. Now lets see how to make Tamilnadu style sorakkai sambar recipe with step by step pictures. Check out my other sambar varieties for rice. Also check out my 70+ kuzhambu recipes ! 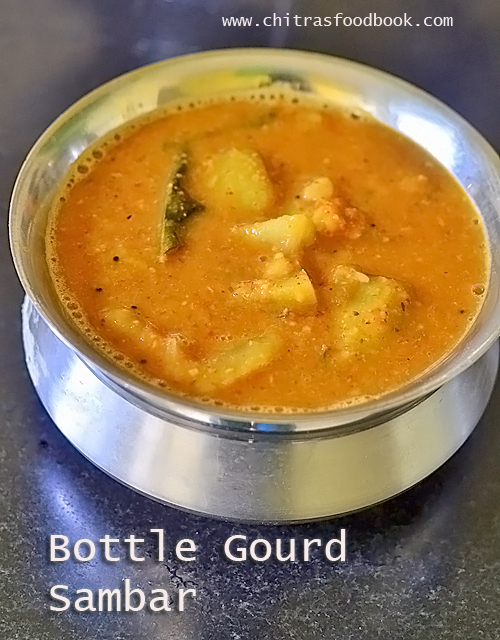 Arachuvitta Sorakkai sambar / Bottle gourd sambar for rice with freshly ground masala. Wash and peel the skin of sorakkai / bottle gourd. Cut into two and chop the spongy portion. Discard it. Chop sorakkai into big cubes and set aside. In a pressure cooker, take the toor dal, chopped bottle gourd, onion, tomato, green chilli, cumin seeds, required water and a drop of cooking oil. Cook for 1 whistle in very low flame. Mash the dal gently and set aside. Heat oil in a kadai. Roast all the items given under “To roast and grind”. Grind to smooth paste. To the cooked dal add tamarind extract, ground masala paste, salt and some water. Roll boil for 5 minutes till nice aroma wafts. Temper in ghee and add to sambar. Garnish with coriander leaves. Serve with rice ! Soak tamarind in 1 cup of water. Wash the bottle gourd and peel its outer skin using a peeler. Cut into two pieces and remove the center, spongy part using a knife and hands. Discard the soft part with seeds. Now chop the sorakkai into big pieces as we are making sambar with it. For poriyal or kootu, you can chop it finely. In a pressure cooker base, take toor dal, chopped bottle gourd, chopped big onion, tomato, slit green chilli, cumin seeds, turmeric powder, required water and a drop of cooking oil. Keep the flame high and cook till steam starts to come out of the nozzle. As soon as steam comes out, lower the flame completely and put the weight valve. Let it pressure cook in very low flame for one whistle. It may take 8 to 12 minutes depending on the size of cooker. (If you use small sized cooker, keep it in small burner gas stove. For bigger sized cooker, use big burner.). Open the cooker lid after the steam is released on its own. Mash the dal gently with a ladle. Make sure you don’t mash the sorakkai pieces. While pressure cooking, you can roast the ingredients for sambar masala. For this, heat 1 tbsp oil in a kadai. Roast chana dal, urad dal, red chilli, methi seeds, coriander seeds and raw rice. Roast in medium flame till dal turns golden brown. Do not burn any ingredient. After roasting, grind everything to a smooth paste adding coconut and water. Add 1 cup of tamarind extract, sambar powder (optional), ground sambar masala paste to the cooked dal. Adjust the consistency of sambar by adding water. Add required salt. Let the sambar roll boil for few minutes till nice aroma wafts through your house. Add little water based on the thickness of sambar. Switch off the flame and garnish with finely chopped coriander leaves. Last but not the least do the tempering part. Heat 1 tbsp ghee in a small kadai. Splutter mustard seeds, curry leaves and add to sambar. Mix well and close with a lid. Give a standing time of 30 minutes to 1 hour for best taste and flavor. Mix this sambar with plain rice. Do not forget to add few drops of ghee while serving ! (This sambar thickens as it cools down. So add some water, give a boil and serve hot whenever needed). Enjoy ! Do not chop sorakkai into small pieces. It gets mashed up while pressure cooking. So use big pieces. Adjust the quantity of red chilli as per your spice level. This sambar thickens over time. So you should add water whenever needed, give a boil and serve hot. Addition of sambar powder is optional in arachuvitta kuzhambu. But I use little. Do not forget to temper in ghee for more flavor. 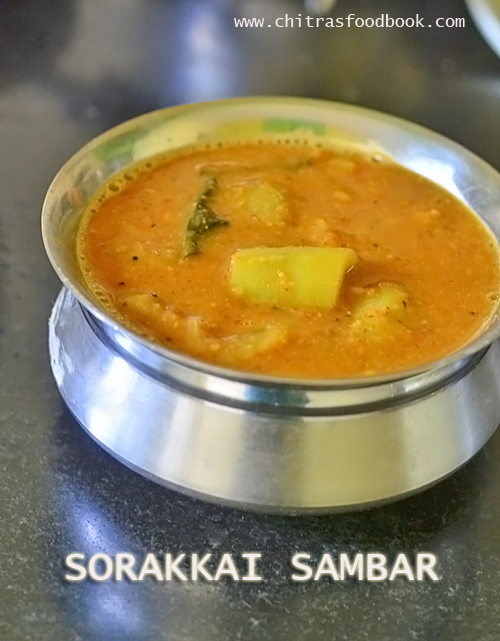 Try this yummy sorakkai arachuvitta sambar and share your feedback with me. We make keerai sambar for rice at least once in a week. Usually I add Arai keerai or mulai keerai (Amaranthus) to make sambar. This time I prepared keerai sambar with palak / pasalai keerai / spinach. It came out well with a nice flavor. We liked it very much. 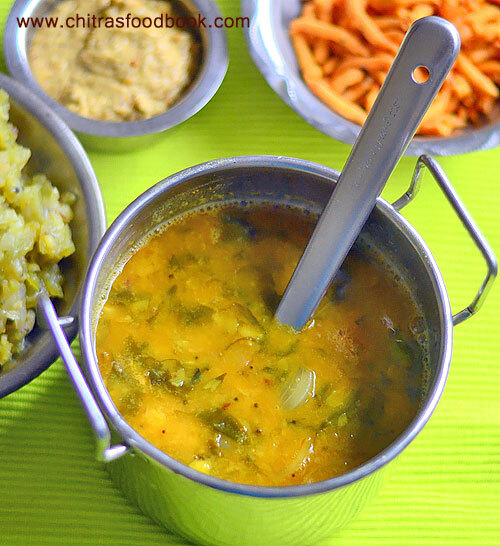 This sambar can be prepared quickly as palak takes less time to cook. 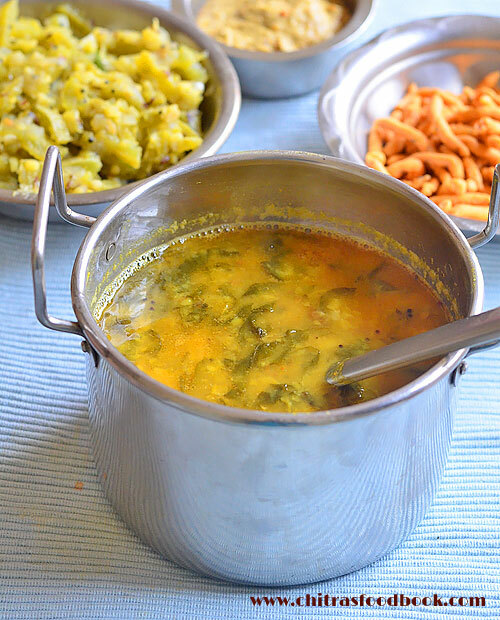 This palak keerai sambar is definitely a welcome change from my Dal palak and Palak kootu. 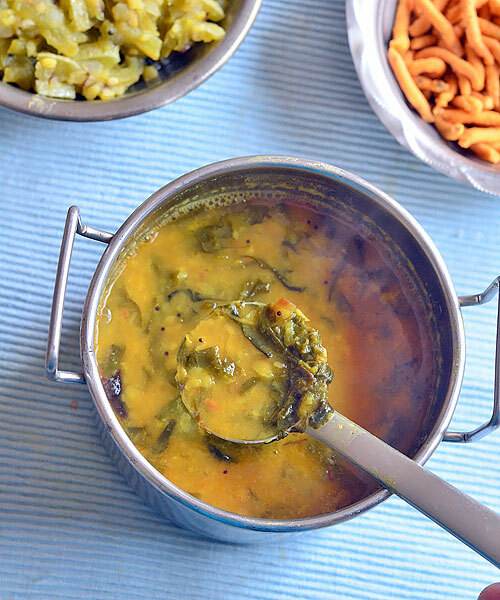 Friends, do try this healthy, yummy palak sambar / spinach sambar and share your feedback with me. Lets see how to make Tamil nadu style pasalai keerai sambar with step by step pictures. Wash and chop palak roughly. Soak tamarind in 1 cup water. Pressure cook toor dal in enough water and mash it. Heat oil in a kadai. Temper and saute onion, curry leaves. Saute palak and add tamarind extract, sambar powder, salt and turmeric powder. Let it boil for a minute. Lastly add the cooked dal and boil for few minutes. Transfer to a bowl and serve hot with plain rice adding ghee.Enjoy ! Soak tamarind in 1 cup warm water for 15 minutes. In the mean time, take the toor dal, 1/4 tsp turmeric powder, few drops of cooking oil in a pressure cooker. Cook in low flame for one whistle. Open the cooker after steam is released. Mash the dal and set aside. Wash and chop the keerai roughly. Keep it aside. Heat oil in a kadai and splutter mustard seeds, methi seeds, urad dal, red chilli and curry leaves. Saute onion till transparent. Add the chopped palak and saute till the keerai shrinks in quantity. Add 1 cup of tamarind extract, sambar powder, turmeric powder, salt and hing. Boil till onion & palak cooks well. Then add the cooked dal and boil for a minute. Add more water and adjust the consistency of sambar. Switch off the flame and transfer the sambar to a bowl. Serve hot with plain rice adding few drops of ghee. Adjust the amount of sambar powder and red chillies as per your taste. Do not use tomato as the combination of palak and tomato is not good for people with kidney stones. For variations, replace sambar powder with 1 tsp of red chilli powder and 1/2 tsp of dhania powder. 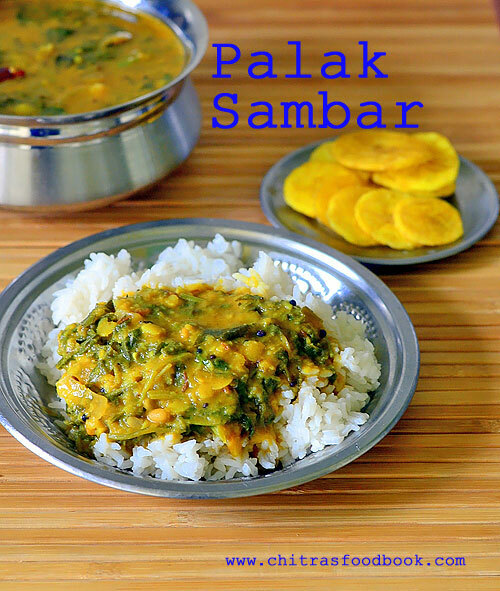 Try this easy, yummy, healthy Palak sambar for rice and enjoy with your favorite poriyal / curry and appalam / papad ! Recently my MIL gave me a big bunch of Ponnanganni keerai from our Salem house backyard. It is known as Dwarf copper leaf Alternanthera sessilis) in English, ‎Gudari Sag in Hindi, ‎Ponnaganti Koora in Telugu, ‎Honagonne soppu in Kannada, ‎Kozuppa, Ponnankanni in Malayalam.There are two varieties available in the market. One is with green leaves called nattu ponnanganni and the other is with pink leaves called seemai ponnanganni. In this sambar recipe, I have used the one with pink leaves. This keerai has so many health benefits. 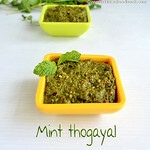 Its very good for eyes, helps to reduce body heat, cures piles, head ache, asthma and many more. I prepared this sambar for rice following my MIL’s keerai sambar recipe. It tasted so good. We loved it very much more than Ponnanganni keerai poriyal or kootu. You too give a try. Lets see how to make Ponnanganni keerai sambar recipe with step by step pictures. 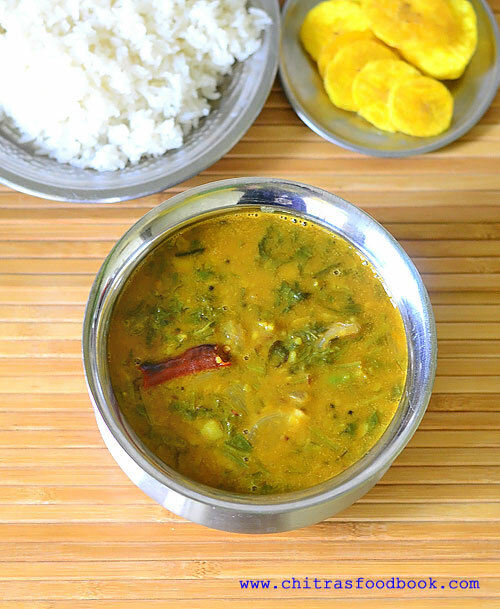 Do check out my Keerai sambar recipe, Keerai kootu, Arai Keerai masiyal. Pluck the leaves of keerai and set aside.Soak tamarind in 1 cup of water. In a pressure cooker base, heat 1 tsp of oil and saute the keerai for few minutes. Add toor dal, turmeric powder, water and pressure cook everything for 2 whistles in very low flame. Remove the lid after steam is released. Mash the dal well and set aside. Heat oil in a kadai and splutter mustard seeds, methi , cumin seeds, red chillies. Saute big onion or small onion till transparent. Add tamarind extract, sambar powder, turmeric powder, hing and salt. Boil till tamarind smell goes off. Now add the cooked dal + keerai and boil for few minutes. Remove and transfer to a bowl. Serve hot with plain rice adding few drops of ghee. Wash the keerai leaves and set aside. Soak tamarind in 1 cup of water and take the extract. Peel and slice onions. Heat oil in a pressure cooker with 1 tsp of cooking oil. Saute the leaves for one minute. Add toor dal, turmeric powder, few drops of cooking oil. Let it pressure cook in very low flame for 2 whistles. Remove the lid after the steam is released. Mash the dal using a whisk and set aside. Heat oil in a kadai and splutter methi seeds, mustard seeds and cumin seeds. Saute red chilli or green chilli, curry leaves and onion. Saute till onion becomes transparent. Add 1 cup of tamarind extract, sambar powder, turmeric powder, salt and hing. Boil for few minutes till nice aroma comes. Now add the cooked dal + keerai. Mix well and boil for 3 minutes till the desired consistency is reached. Add more water based on the thickness of sambar. Switch off the flame and transfer the sambar to a bowl.Serve with plain rice adding few drops of ghee. Enjoy ! You can replace sambar powder with 1 tsp of dhania powder + 1 tsp of red chilli powder. Adjust the quantity of keerai as you wish. I like to add more keerai in the sambar. 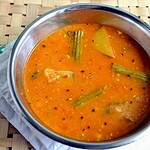 Reduce the number of red chillies for less spicy sambar. Try this healthy ponnanganni sambar for rice and enjoy ! 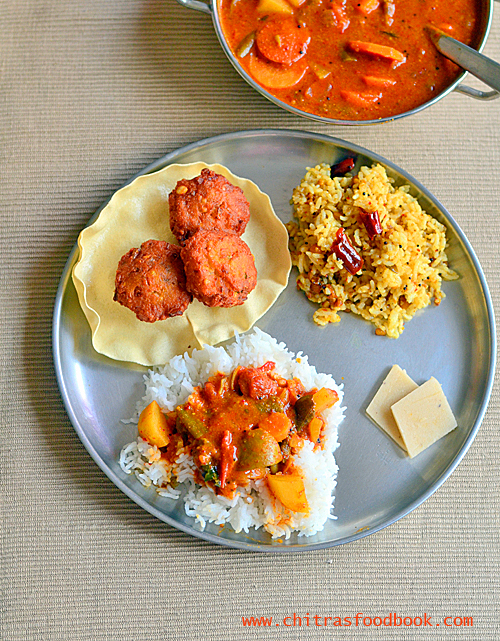 I learnt this cabbage sambar / muttaikose sambar recipe for rice from my friend Shalini. She told 3 different ways of making this sambar in South Indian style but I chose to try cabbage sambar with freshly ground masala like arachuvitta sambar. It came out very flavorful and great in taste. We couldn’t even find any trace of raw cabbage smell in the sambar. If you want to try no onion, no garlic sambar recipes for festivals or occasions, you can try this recipe. Sendhil is not a big fan of cabbage recipes. But he loved this sambar a lot and told me to prepare it often. It tasted good with idli, dosa as well. After making it thrice in the last 2 weeks, I am posting this recipe. Friends, Do try this muttaikose sambar recipe for a change and share your feedback with me. Ok, lets see how to make South Indian Cabbage sambar recipe with step by step pictures. cabbage poriyal, purple cabbage poriyal, purple cabbage salad, Cabbage kootu, Cabbage vada recipes. Soak tamarind in water. Wash and chop cabbage. In a pressure cooker base, take all the ingredients mentioned under “to pressure cook”. Add water and cook in low flame for 2 whistles. Mash the dal well after steam is released. Set aside. Heat oil in a kadai and roast the spices for sambar. Grind to smooth paste. Take 1 cup of tamarind extract and add to cooked dal in pressure cooker. Add ground masala, salt, sambar powder, jaggery, hing and boil the sambar for few minutes till nice aroma arises. Temper in ghee and add to sambar. Switch off the flame. Garnish with coriander leaves. Cover and leave for 2 hours before serving for all the flavors to blend well. 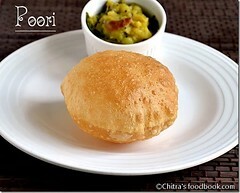 Serve with hot rice drizzling ghee. Soak tamarind in warm water. Take 1 cup of tamarind extract and set aside. Wash and chop cabbage into thin or thick slices as you like. Peel and Chop onions. In a pressure cooker base, take toor dal, chopped cabbage, chopped onion (optional), turmeric powder, few drops of cooking oil and few torn curry leaves. Pressure cook in low flame for 2 whistles. Mash the dal with a ladle after steam is released. Set aside. Heat oil in a kadai. Roast all the ingredients given under “to saute and grind” in medium flame without burning it. Lastly add the coconut, switch off the flame and mix well. No need to roast the coconut. Just mix with other roasted spices. Let it cool. Grind to smooth paste adding water. Add 1 cup of tamarind extract to the cooked dal in pressure cooker. Add the ground masala paste, sambar powder, salt, hing and jaggery. Mix well and roll boil the sambar for few minutes till nice aroma arises. You can add some water if sambar is too thick. Heat ghee in a small tempering pan. Add mustard seeds, red chilli, curry leaves and let mustard start to splutter in low flame. Add this to the sambar. Mix well and garnish with coriander leaves. 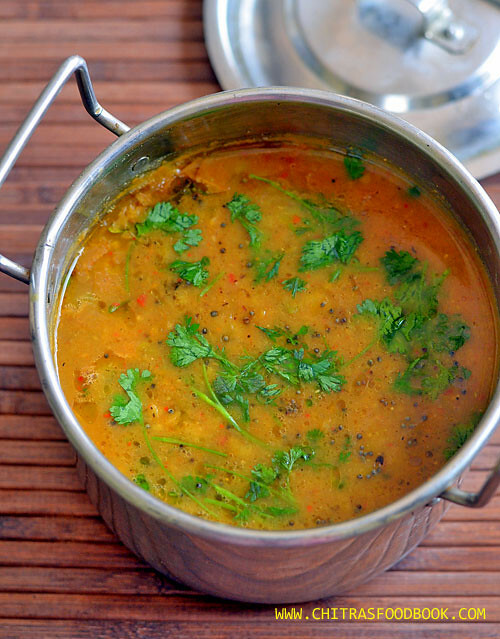 If possible, rest this sambar for 2 to 3 hours before serving for all the flavors to infuse well. 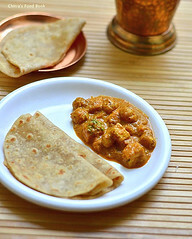 At the time of serving, you can reheat it or serve it with plain hot rice drizzled with ghee. 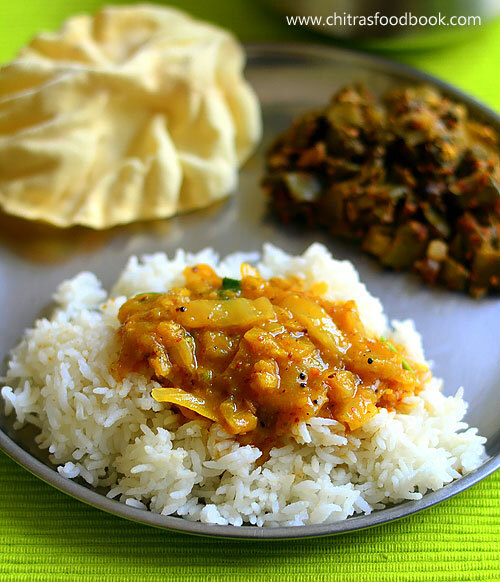 Enjoy this cabbage sambar with any poriyal and papad/ appalam. Adjust the quantity of red chillies as per the taste. 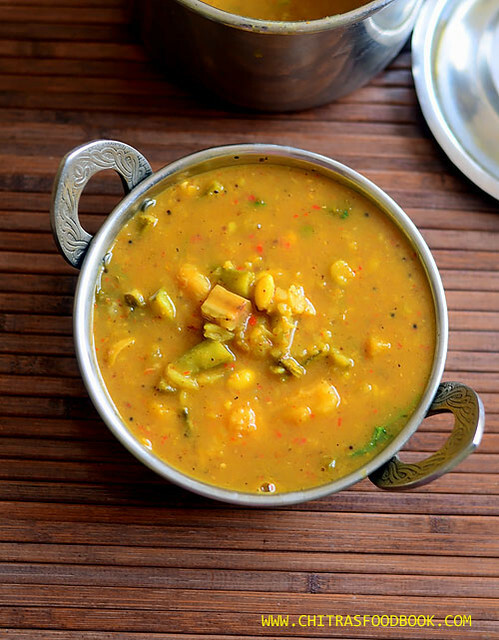 Tempering in ghee adds a nice flavor to this sambar. Do not skip it. Do the tempering only at the end. 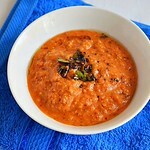 Tomato is not necessary for this sambar.If you want to add, saute in oil and then add to cooked dal. 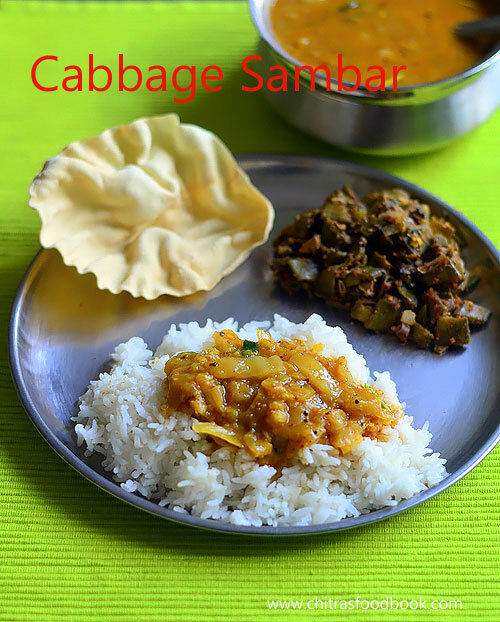 Try this easy, yummy cabbage sambar for a change and enjoy with plain rice, poriyal and appalam ! People in Tamil nadu prepare Pongal kuzhambu on Pongal festival day adding 5 or 7 vegetables. We call it as 7 kai kuzhambu or kootu in Tamil. There are many versions for Pongal kuzhambu. It differs based on their custom. 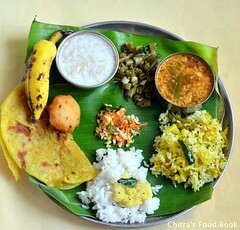 In Chettinad region, people make it without adding any dal or coconut. But this version is a no onion, no garlic Arachu vitta sambar kind of Pongal kuzhambu I learnt from my friend Shalini. But the quantity of dal and coconut used is very less for this kuzhambu. It is prepared with freshly roasted & ground spices. So its too flavorful just like Brahmin’s style arachuvitta sambar. Shalini told me to use 5 vegetables. So I blindly followed her recipe and came up with this version. If you are making on a normal day, you can skip all these vegetables and use yellow pumpkin alone. 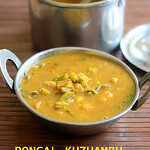 This pongal festival sambar tastes good with white pongal / Paal pongal, rice, ven pongal and idli,dosa. Friends If you are planning to make Pongal kuzhambu with mixed vegetables in sambar taste, you can follow this recipe. You will like it for sure.Next year before Pongal festival, I will try to share Chettinad Pongal Kuzhambu Recipe. Now lets see how to make no onion, no garlic pongal festival kuzhambu with step by step pictures. Check out my Brahmin style Thalagam kuzhambu recipe too ! No onion, no garlic mixed vegetable kuzhambu for Pongal festival day ! Wash and soak toor dal. Chop all the vegetables and keep aside. In a pressure cooker base, take toor dal and add vegetables, green chillies. Cook for 2 whistles in low flame. Open and mash the dal. To the cooked dal, add tamarind extract, roasted & ground masala. Boil for few minutes. Temper mustard seeds, curry leaves and add to sambar. Garnish with coriander leaves. Serve hot with white pongal / Paal pongal. Wash and soak toor dal in a cooker base. Wash and chop all the vegetables into cubes and set aside. Soak tamarind in 1/2 cup of water. Take the extract and keep aside. Add chopped vegetables to toor dal. Add slit green chilli. Add required water, turmeric powder and cook for 2 whistles in low flame. Remove the lid after steam is released. Mash the dal well. Set aside. Heat 1 tsp oil in a kadai. Roast all the ingredients given under “to roast and grind” and grind to a smooth paste. Add this paste and tamarind extract to the cooked dal.Mix well and boil for few minutes till its raw smell goes off. Temper mustard seeds, curry leaves in ghee and add to sambar.Garnish with coriander leaves and serve with white pongal / Paal pongal. This sambar tastes good with idli , dosa too. Adjust the quantity of red chilli as per your taste. Do not add more tamarind. 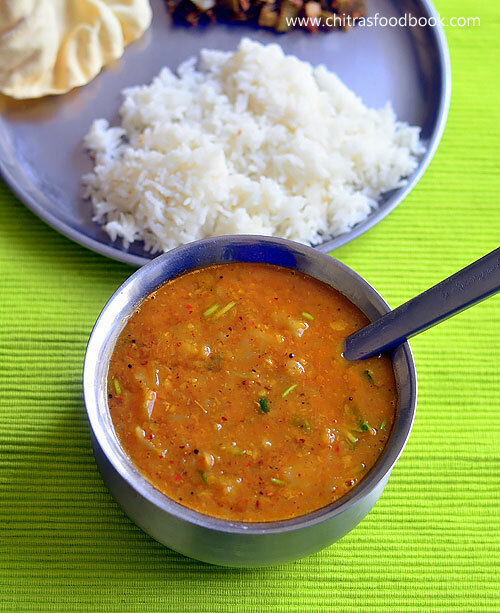 You can skip toor dal if you want to make this kuzhambu without dal. But adjust the quantity of coconut and roasting spices to give thickness to kuzhambu. 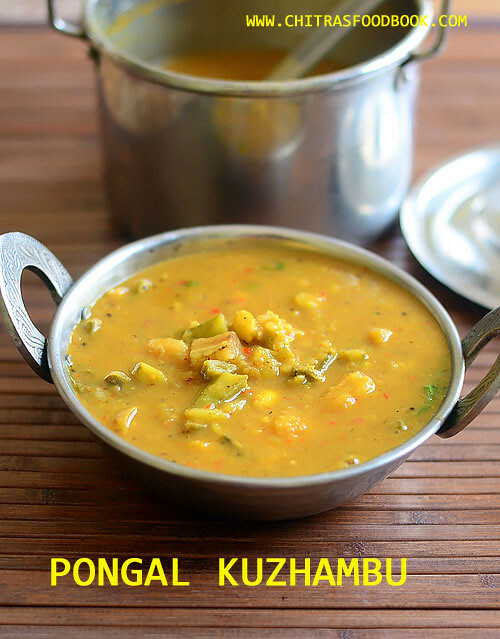 Try this yummy Pongal kuzhambu with 5 vegetables and enjoy !